I am getting more interested in video shooting, especially after getting the EM1, which has a significantly better video codec than the EM5 with cleaner shadows. And a major part of having a good video is to have good audio recording, and this is where this post comes in. I am no expert in either video shooting or audio recording, but I am doing my best to learn both, and recently I've been learning a lot about audio production and processing, did you know for example that recording audio in WAV format is akin to shooting stills or video RAW in the sense of getting a higher latitude for post-processing, and a better dynamic range where you can save your audio file from clipping and distorting? I used to have the Zoom H1 handy recorder you see above, it is a great start for anyone who wants to improve their audio, it is small, relatively cheap ($99), convenient, has nice features, records uncompressesed WAV audio, and produces way better audio than your DSLR or camera can produce. 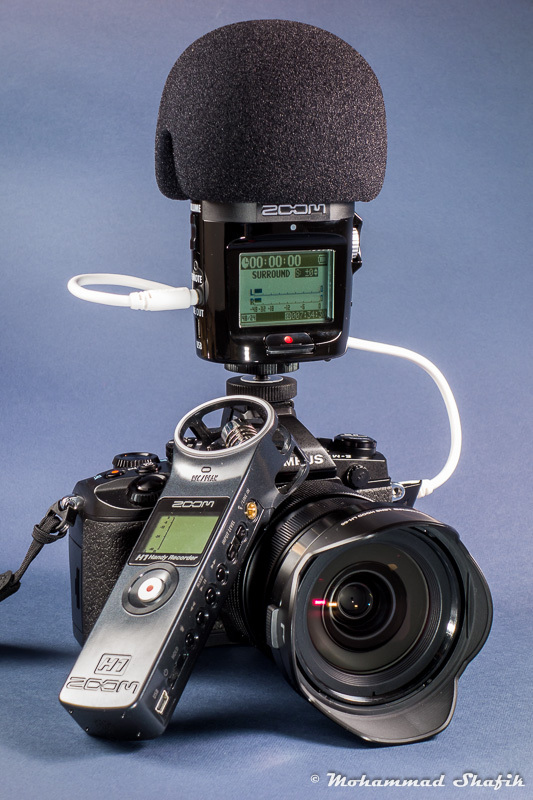 You can even connect an external lavalier mic (the small ones that clips to your shirt, I have the ATTR 3350, but I am buying a new one) and connect it to the Zoom H1 hidden in your pocket, it is quite a versatile product. And the best feature I like about it, is that it simply mounts to my camera's hotshoe (via a trivial adapter), and I connect its audio output to the camera's mic input, so that the camera is getting its audio signal from the Zoom H1, aand -pause for effect- it is recording uncompressed audio at the same time, so that I have the option to use the raw audio recorded by the Zoom H1 in case anything happens, neat. 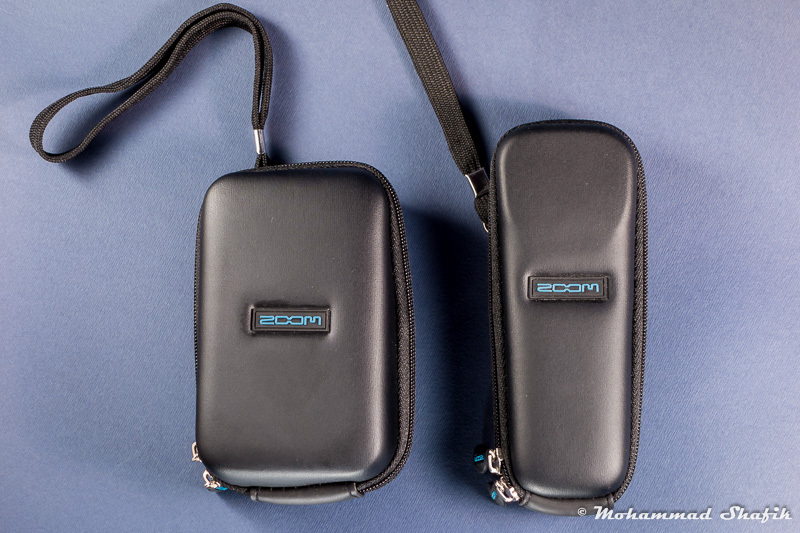 For some unknown reason (assuming GAS is not a known reason), I got interested in the Zoom H2n, and when I got two offers to sell my H1 (all by chance, I didn't seek selling it, I swear), I sold it, along with its accessory pack, and bought the Zoom H2n with its accessory pack. 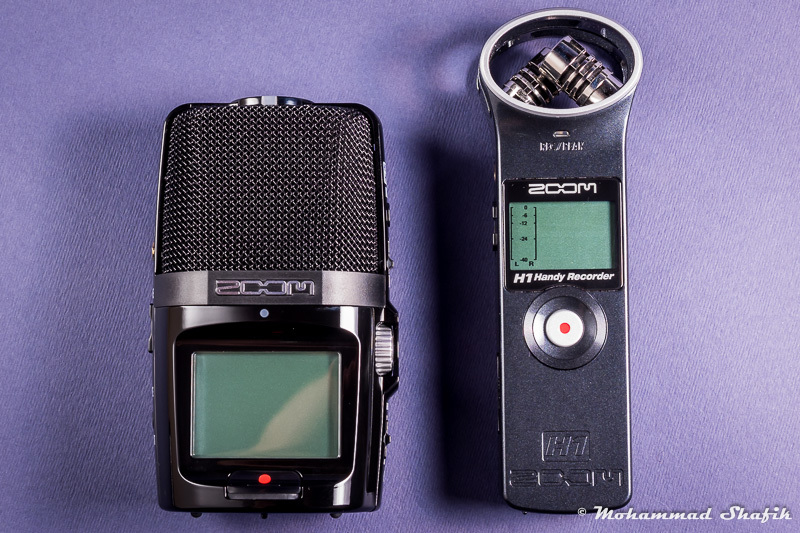 I won't go into details comparing both products, but the Zoom H2n has way more features compared to the H1, including five (yes, five!) built-in high quality mics, which can record audio in several directions (think an interview, someone infront of the mic, and someone on the other side, or a meeting), and it lets you configure the track mixing levels in post. Have a look (and hear the audio samples) at this convincing review. Above you see my little friend, it is quite larger than the H1, but it is still pocketable, and for what it can do, I like it a lot, I shot a couple of videos last weekend, and the results are very exciting. Here's how it looks like on the EM1 with a hair cut. Now a little bit of photography, did you notice how the background color looked different through this review? All the product shots not including the camera were shot using the EM1, while the other shots were taken with the Sony RX100, the color palette is very different despite having the same WB, and I wasn't able to match them in post. 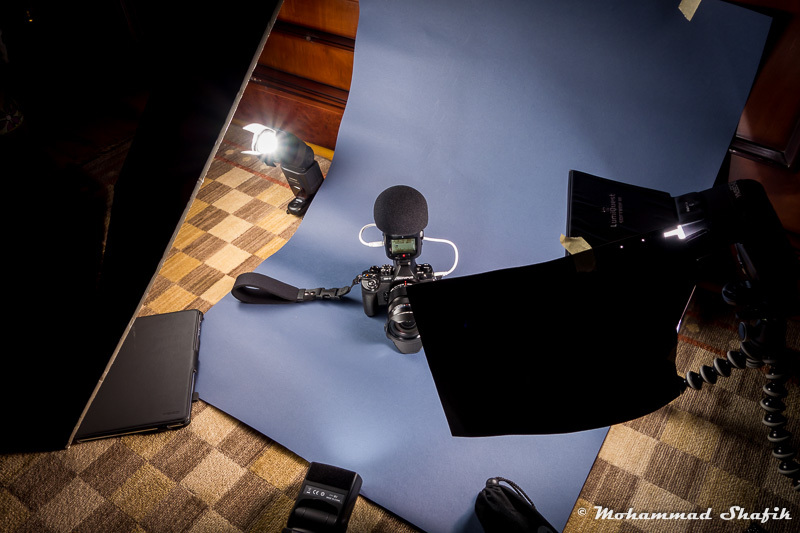 Below are two shots showing the lighting setup, it is not an elegant setup, but I was in great hurry and I didn't want to bounce my flashes off the ceiling. 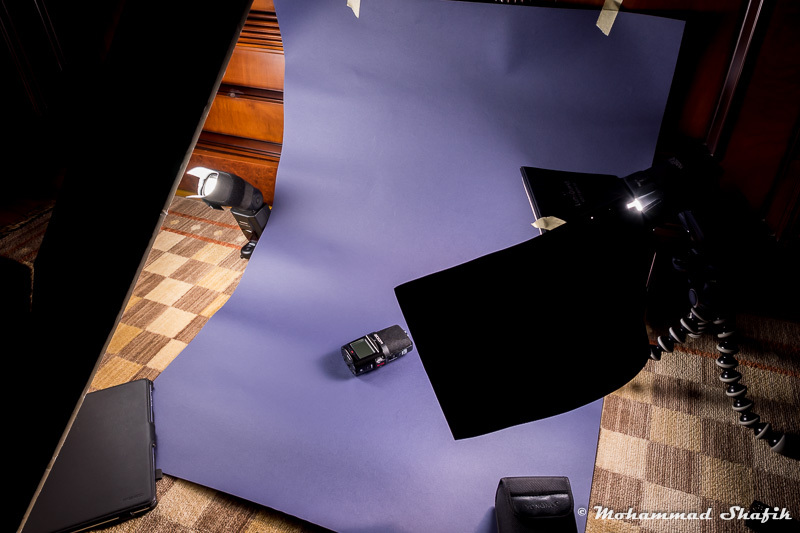 This is the setup for the initial product shots using the EM1, the flashes were triggered by the Yongnuo RF-603 transcievers, key light is a flash on the right shooting into a Lumiquest SB III softbox, and I used another flash for fill bounced into a white foam cardboard. 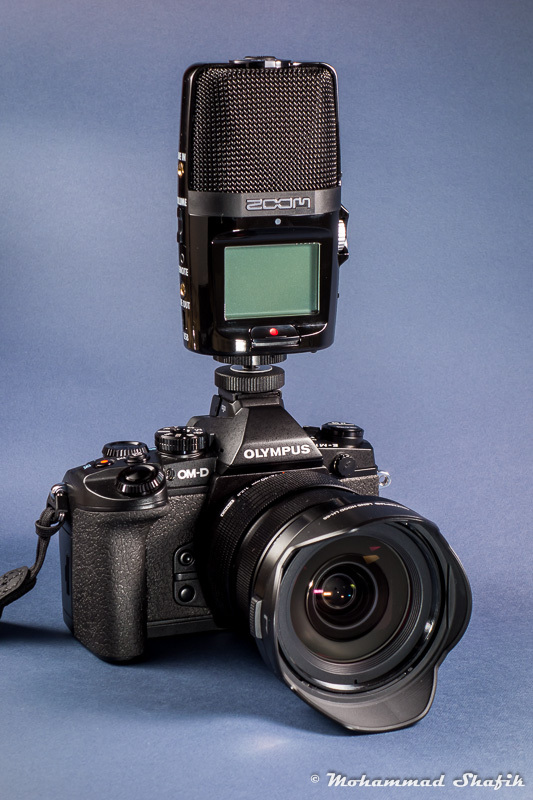 For the next setup where I shot the camera, I switched my flashes to be optical slaves, and I added a third bare flash at the front to open the very deep shadows between the grip and the lens, and inside the lens hood. which camera produced the more accurate colour? That's an excellent question, I thought of commenting about it in the post, but I didn't. Actually neither is very accurate, see I was shooting under daylight CFL lighting, which you don't see in the picture (because of the high sync speed/low ISO), and the actual colors looked something between them, it is definitely less magenta tinted than the EM1 pictures, but not as pale as the RX100. I'd say it is closer to the RX100 though. Get a ColorChecker Passport, and make profiles for your cameras. That will ensure consistent results regarding colour. I wanted to buy one a while ago, but for $99 it was too much, especially that I am not a working photographer, and I don't print professionally. I found an alternative on Amazon for $24, and it is still more than I am willing to pay. Thanks for the suggestion, I will keep it in my mind. Well, I just found your blog, and I have to say it is quite nice, still looking around though. I found your checker passport post and will read it. There must be an easier way for people to find interesting blogs talking about MFT, the only way I find about them is by chance like this time, or through 43rumors readers work. 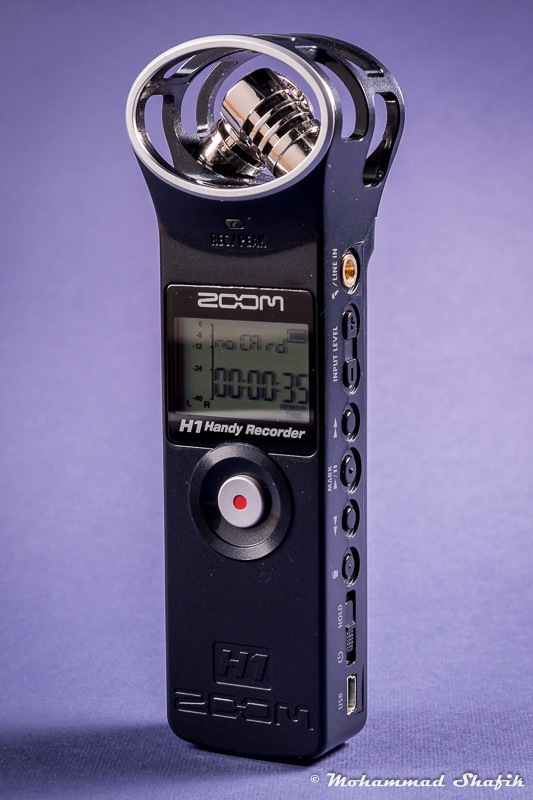 I'm very interested in using the Zoom H2n for my video recordings. 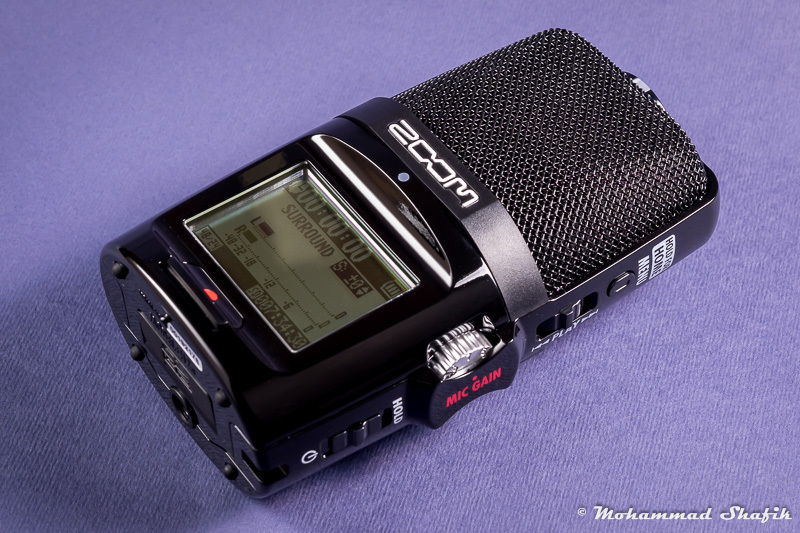 When filming handheld, does the H2n inadvertently pick up any camera handling sounds? 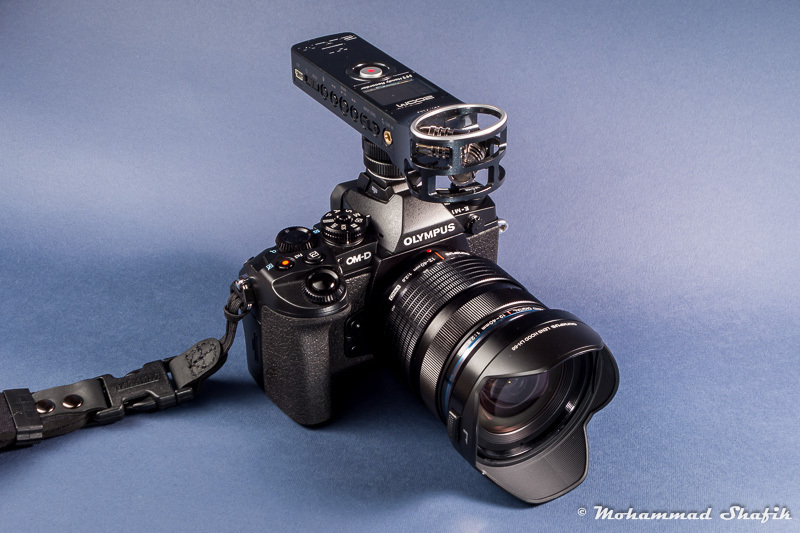 I'm a bit concerned being that the H2n hot-shoe mount has no shock absorbing. Yes it certainly picks up camera handling sounds mounted that way in the picture. But since I usually shoot videos on a tripod, this does not represent an issue. The other two alternatives is to have the mic mounted to a separate mount when shooting video which doesn't make sense if you're on the move, and if you're going to have camera handling sounds anyway iusing the built-in mic, then at least you van get better sound quality using the Zoom, and try to be very careful when handling the camera. Finally, maybe there is a shock mount for this mic, but it would be enormous.